Aston Villa need to improve after a poor start to the season | The Transfer Tavern | Where football transfer rumours fly or die! Aston Villa’s 4-1 thrashing at the hands of Southampton on Saturday was yet another painful reminder of just how much of a tough job Paul Lambert has let himself in for. Lambert thrived under a largely unpressurised environment at Norwich last season, as anything other than survival was considered a welcome bonus amongst Norwich supporters. That he guided his side to a 12th place finish, this on the back of successive promotions, highlights just what a capable manager Lambert is and why Aston Villa were so keen to get the Scot on board. Of course, things are contrastingly different at Villa Park than at Carrow Road, and Lambert will have been well aware of this before he accepted the job. Aston Villa supporters demand more than simply securing Premier League football season after season. With the glory days of three consecutive 6th place finishes under the guidance of Martin O’Neill still fresh in the minds of Aston Villa supporters, expectations have understandably mounted. With higher levels of expectations come higher levels of pressure, and Lambert needs to deal with this added factor if he is to succeed at Aston Villa. So what can be done about Aston Villa’s current predicament? The cheap surrender of a one goal half time lead at St Mary’s on Saturday was the hallmark of a team that are preparing for a relegation dogfight, and the situation quickly needs rectifying if Villa are to maintain their proud long standing tradition of being a top flight side. The first thing Lambert needs to address is how to clean up the mess left by Alex McLeish, who was sacked in the summer after just a solitary season at the helm. It was an ill-judged appointment that always seemed destined to fail, especially considering the Birmingham City connection. It seems a negative philosophy has been drilled into the squad under McLeish, playing not to lose rather than playing to win often appeared to be McLeish’s strategy. This philosophy didn’t go down well with Villa supporters, and understandably so. Paul Lambert needs to stamp his authority on the club and create a positive atmosphere akin to how he did at Norwich. Lambert got his inexperienced Premier League side playing beautiful attacking football, with freedom and without fear. This needs replicating at Aston Villa. Another factor that needs to be given serious thought is how to get the best out of Darren Bent. Bent is one of the most natural goal scorers in the Premier League, and he is surely Villa’s most prized asset. Remarkably, his goal at Southampton was his first since February, although injury was a large reason for that barren run. 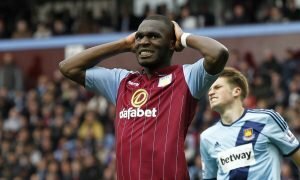 Lambert will be hoping that Bent and new signing Christian Benteke can quickly form a successful partnership, spearheading Villa’s attack. Finally, Lambert will undoubtedly look to strengthen his side in January for the Premier League run in. One player who has been rumoured to be interesting Lambert is Dan Gosling. Gosling has struggled to work his way back into the Newcastle picture after recovering from a knee problem that had sidelined the former Everton midfielder for the best part of a year. He may prove just the kind of versatile player that Villa desperately need. Should Aston Villa not address these issues, then a season of struggle may well be on the cards, and that long running top flight status may be living an increasingly charmed life.